generally able to provide a suitable alternative in many cases. Only needs compressed airto operate: That’s right, in most cases all Hovair Systems standard load moving equipment, such as air bearing kits, air pallets, aluminum transporters, air lifting jacks etc., only need a supply of compressed air to enable them to operate. Electricity or other power sources are not essential for their operation. No overnight charging or gas bottle changes: The beauty of these pneumatic powered systems is that their power source is pneumatic – compressed air. In addition to not needing other power sources such as electricity and propane gas, you also enjoy the fact that there are no overnight charging chores, or gas bottle exchanges to ensure these load moving systems keep running. All you need to do is keep your shop compressor in tip-top running order and you are in business. concerns. All equipment that leaves our factory is accompanied by an Operator Manual which highlights various safety advisories and how to stay safe while operating our equipment. Lift and move loads of weights up to 300 tons, and more: Hovair Systems load moving equipment is capable of moving lightweight, delicate machinery or similar loads as little as 500 pounds in weight, right through to giant-sized transformers weighing up to 300 tons and more. Starting with the smallest air bearing kits you can easily move a load of two tons without having to take a breath. It really is that easy! it for you. How? By placing caster modules at the most important places of the load – where it needs the most support. 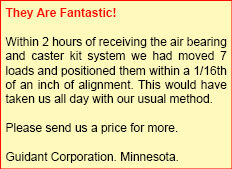 You will be amazed at the versatility of these air bearing and caster load moving systems. Loads of uneven and disproportionate weight distribution: This is one of our most popular requests – how can we move a heavy machine or load that is 4 tons at one end and only 2 tons at the other end? Try doing this with a forklift and it will almost certainly tip over. Using the tremendous versatility of an air bearing and caster system, you can make this task a piece of proverbial cake. Here’s an example of how it can be done. So no matter how unevenly the weight of your machine or load is distributed, you can be sure of a Hovair Systems solution. other valves and tee-pieces. You can even run two air supply lines to two air inlet ball-valves and run two systems simultaneously under the same load. Pinpoint accuracy and load positioning: Because your load moving system will be floating on air, there will no restrictions on how it can move – except for any objects that might need to be cleared from its travel path. Your load will really be floating just above the floor surface. This means that its travel path has become truly omni-directional. That’s right, once floated, you can spin it on a dime. Just imagine, no more pushing and shoving to line up the load, no more dropping it to change direction, no more struggling to get it in place. Using this tremendous air power, you can simply adjust the load’s travel at any time during the operation. Stop, start, carry on in the most effortless way imaginable. When you get to where you want your load, simply push it into place with pinpoint accuracy – first time, every time. pound of physical human force to move 1000 pounds of load. So you can see just how easy it for ANYONE to operate this efficient load moving equipment. Gals as well. That’s right, we have many clients using load moving equipment that is being operated by teams of female workers. As well as flexibility for the client, it also helps to increase worker productivity. No special training required: Because of their inherent low safety risk, pneumatic powered load moving equipment does not require any special training for its operators. Unlike forklift truck drivers and crane operators, you do not have to undertake any special training to attain a certificate of competence to use our products. All you need is a little common sense and a good working knowledge of basic compressed air safety and other rules and regulations within your workplace. into the same position time after time. Could it be any easier? A smooth level, non-porous floor surface -preferably smooth concrete or polished wood, Crack can be filled. A desire to save money, time & energy, and to make your load moving operations easier than ever before.